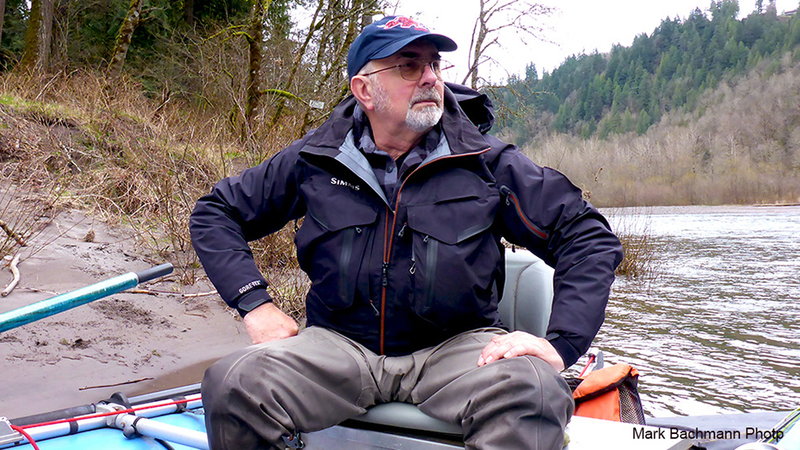 This article was first written for winter steelheaders, because that is what we do most. However, there are a lot of places to fish for trout during the winter as well. So though we refer to steelhead throughout, it applies equally for trout. Do you remember the competition you received from other anglers on your favorite trout stream or lake? Well, they aren't there now, and in a month there will be a lot less of them. Why? Because the cream puffs have gone indoors and the steelheaders have moved west where it is wetter, but warmer. That leaves a lot of productive trout water that you can have all to yourself. Winter weather can mean rain and lots of it. It rains in western Oregon. Our shop in Welches gets around 100 inches of precipitation per year. Most of that comes as rain at 45-degree temperatures between November and April. The word "rain" turns most people off, because they associated it with discomfort. However, rainy days don't have to be uncomfortable if you dress to keep yourself warm and dry. During hard rains, everything in the natural environment is washed and cleaned. Rain softens the edges of the landscape. It dampens sound, and a rainy day on the river can be one of personal intimacy. But, the best reason to fish in the rain is that steelhead are more aggressive during the low light of cloud-cover days. How you dress will make as much difference to your success in winter fly fishing as your choice of tackle. Experienced anglers don't have the time or inclination to use any but the most practical gear. Your performance, comfort and safety depends on how you manage your body temperature. Warm muscles perform better than cold ones. As you lose thermal energy, your motor skills will suffer. Keeping your skin surface free from dampness is one of the biggest keys to staying warm. If you dress correctly, you can be comfortable, even during long days in cold, wet weather. If you don't, you'll be cold and wet. More than just a raincoat and waders. Preparing for rain doesn't mean just the addition of a raincoat and chest high waders. The selection of these items is very important, but what you wear under this outer layer is also crucial. Any moisture trapped within your clothing will conduct heat away. This means that not only does it have to keep the rain out, but your clothing has to also have the ability to disperse and dispel your own perspiration. When dressing for cold or wet weather fishing; dress from the inside out. The layer next to your skin is what you will feel all day. Maximum perspiration zones are your armpits, groin, and feet. All these areas need special clothing. Your inner layer should be made from synthetic material or wool for maximum comfort. It should be soft and designed to wick moisture away from your skin. The best winter base layer we have found is Montana Wool made by Simms. Our choice as a layer over the top of wool is Waderwick Fleece. This two layer system will keep your legs warm in water temperatures down to 50-degrees. For colder water, consider adding a second layer of fleece over the top of your wool base layer. Wool, nylon, acrylic and polyester do not retain as much moisture as cotton or silk. Wool is the only natural fiber that will keep you as warm as synthetics. Montana Wool (merino wool) is more expensive, but is better insulation than any synthetic fabric. Dressing with layers of wool and synthetic materials can further customize the wicking of moisture away from your body, helping to keep you roasty-toasty during what would otherwise be inhospitable climatic conditions. Pay special attention to the layers that cover your legs and feet. These extremities are the ones that will be immersed in cold water. When water temperatures are below 50-degrees, double, or even triple, layering is recommended. Never wear cotton clothing during winter. Cotton retains moisture and has very little insulation value when damp. It also becomes a medium for fungal infections. The organisms that cause infections such as jock itch and athlete's foot can not live in synthetic fabrics. These organisms don’t like wool either. Synthetic materials and wool tend to pass-through, rather than retain moisture from perspiration. Your outer layer is your first layer of defense. It must be waterproof, but it must also be able to dispel any moisture that might collect inside it. This is accomplished by a special membrane sandwiched between two layers of protective fabric. This membrane is porous so it can breathe. The pours are of a diameter that allow smaller gaseous molecules to escape, but will not allow larger liquid molecules to enter. Non-breathable waders and rain jackets have all but disappeared from the fly fishing scene in favor of newer technology fabrics such as Gore-Tex. Because of a revolutionary immersion technology from W.L. Gore & Associates, Gore-Tex keeps water from getting in, yet is very breathable, even when completely submerged and allows sweat and moisture to escape. This keeps your skin dry and helps you retain your body heat. Gore-Tex does not stretch, but the articulated knee design employed in Simms G3 Guide Waders allows a streamlined fit with full mobility of the angler. 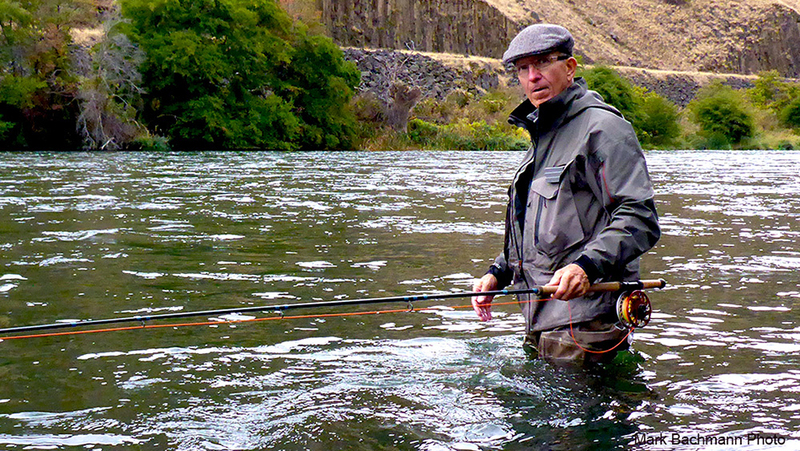 A good fitting pair of waders should mold to your body and give you the most streamlined configuration you can have. This lessens water drag in the currents and makes wading less difficult. Waders with bent knees enable a closer fit than straight legged waders. For durability, multi-layer construction is nearly mandatory from the crotch down. Five-layer construction co-developed by W.L. Gore & Associates, Inc. and Simms was designed specifically for use in fishing waders. Simms/Gore-Tex® waders feature this laminate, which results in the most puncture-resistant, most durable, most technologically-advanced breathable waders you can purchase. Different waders for different seasons. I rotate my waders to suit the climatic conditions that I'll most likely encounter. 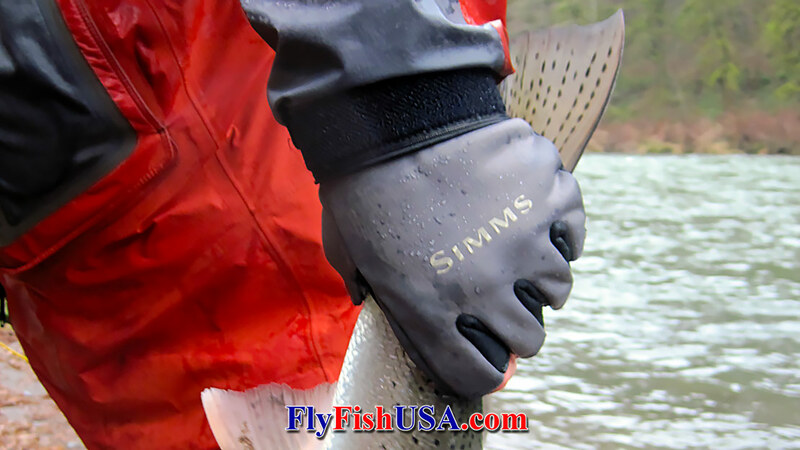 Summer (Simms G3, Size L): Water temperature 55 to 65 degrees, air temperature 55 to 90 degrees. These thin breathable waders fit over light insulating layers. Spring & Fall (Simms G4, Size LK): Water temperature 45 to 55 degrees, air temperature 40 to 50 degrees. Stocking foot waders give better ankle support than do boot foot waders. The extra room inside the K (King designation) allows for more insulation needed during spring and summer months, or for summer trips to Alaska, Tierra del Fuego or B.C. Winter (Simms Stoking Foot or Bootfoot, Size LK): Water temperature 33 to 45 degrees, air temperature 33 to 45 degrees. Simms breathable insulated boot foot waders are the best choice for cold weather fishing. Bootfoot waders will never give as much foot and ankle support support as lace-up wading shoes, but the extra warmth is worth the sacrifice for many anglers. Wading shoes protect your feet and enhance your balance and traction. High top leather or man-made leather wading shoes give better support and last longer per dollar spent, than their cheaper canvas counterparts. Felt soles with silicone carbide studs were considered to be the best traction devices for many years. But felt soles have come under scrutiny because of research that indicates that felt fibers may transport the spores and eggs of invasive species from one watershed to another. Felt soles have been outlawed in New Zealand and a couple of states in the USA. Recently Simms has teamed up with the Vibram Shoe Sole Company to produce footwear that is less likely to transport harmful species. They have produced wading shoe soles that wear longer, hold traction devices better, and are more environmentally friendly than felt. These soles give good traction on most kinds of bottom structure, especially if tungsten headed screws or star cleats are added. Cold weather anglers will enjoy Vibram soles because snow won't stick to them and build up like it does on felt soles. Some guides object to having studded shoes in their pretty boats. If yours is that way, get a different guide. Fly casting, like many other athletic events, depends on good traction. Lately, many states and countries have dropped the idea that felt added to the spread of invasive species. Some companies that rode this bandwagon have gone back to felt soles because of customer demand. We guess you will have to make up your own mind how you feel about felt soles. We carry wading shoes with either felt or rubber soles. A selection of proven wading shoes can be found here. Be sure that your wading shoes fit for maximum support, but have enough room so as not to impair your circulation. Always wear your waders and full under garments when fitting a new pair of wading shoes. 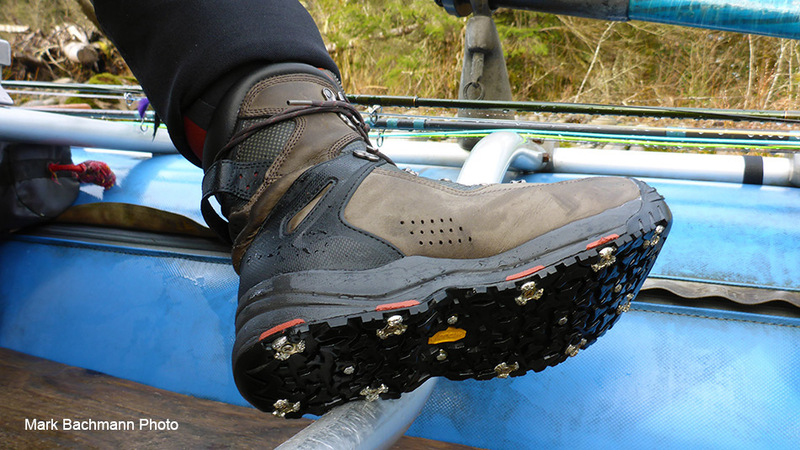 Our favorite wading shoes are Simms Guide Boots. Korkers Wading Shoes with Omnitrax interchangeable soles may be the most advanced angling footwear available. These wading shoes allow you to change soles to fit any environment. Remember, all of your casting and wading performance starts with the bottom of your feet. If you are slipping and sliding, you can't cast very well and you're bound to get wet and cold. bootfoot G3 waders in stock. All other sizes are special ordered. Allow a 2 to 6 week wait as any bootfoot waders may have to be custom made. All bootfoot waders are equipped with felt soles. We recommend the addition of studs or star cleats. Your wading jacket forms the roof over all your innerwear. It must have a weatherproof parka hood. 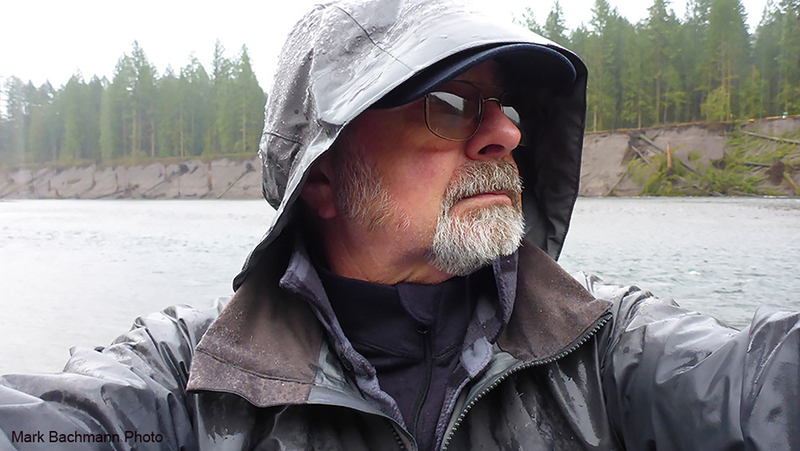 A wading jacket must be impenetrable to rain by keeping water from coming through the fabric shell and must also be designed to keep water from running down your neck or up your sleeves. A jacket that is rainproof is also windproof. If the outer shell material will allow perspiration to pass through without allowing rainwater to get in, you can remain comfortable in just about any kind of weather you will encounter during productive steelhead fishing. Don't forget to consider your hands. Fingerless gloves allow for the dexterity to tie knots, but cover the large veins in your wrists and hands, keeping you warmer. The selection of a hat is of prime importance. It must be waterproof, even though it will be under the hood of your waterproof jacket most of the time. A baseball cap with a bill will shield your glasses from rain and help keep your face moisture free. A Gore-Tex baseball cap is very practical. If the weather's really cold, a cap with ear flaps is advisable.